Our track record shows that the bigger the city you live in, the bigger our results for you will be. If you live in a small town, and aren’t willing to travel to the city where enough prospects are located, then PDA is not for you. Our service is the best in the world for men looking to get the most out of online dating. But we’re not miracle workers. If you expect us to only get you dates with significantly younger, hotter women, who you wouldn’t normally be dating, then PDA is not for you. Your personal dating assistant is specialized to do 1 thing; supply you with a constant stream of attractive women to go on dates with. If you’re looking for a hybrid assistant, who also manages your business affairs, or life in general, then PDA is not for you. As men, our time is money. PDA offers online dating services for professionals, who don’t have time to fuss with it themselves. 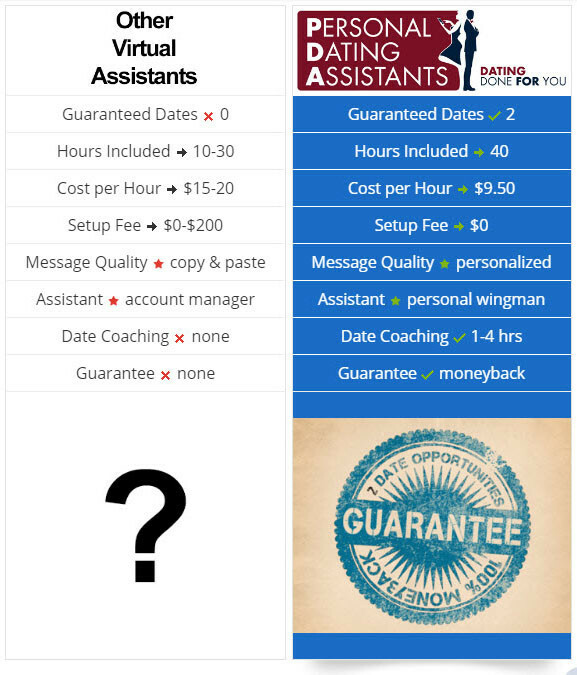 Our dating assistant service works out to $9.50 per hour on average. How much is your time worth? If you’d prefer to spend your valuable time going on actual dates with women, instead of messaging with them endlessly, then a Personal Dating Assistant might be right for you. Making online dating work is a steep learning curve. If you’re like most men, you have better things to do than invest months of hard work just to see minimum results. Far fewer are willing to invest the thousands of hours required to really crack the code, and get dates consistently. If you’ve got enough on your plate as it is, and prefer to leave the heavy lifting to the experts, then PDA might be for you. We already outsource the things in our life that are too repetitive, time consuming, or difficult to do ourselves. If you’ve reached a point where you’re comfortable delegating, and like the idea of retaining a trusted expert who handles your lead generation for dating, then PDA might be for you. Other virtual dating assistant companies tweak profiles, send copy & paste messages, and treat you like a number. We know, because we’ve hired them. PDA was created because the type of outsourced online dating service men really wanted, simply did not exist. We knew the process could be done better. So we made it a reality, for guys who wanted more than the half-baked solutions out there. These professional dating services are for men without the time, interest, or expertise in doing it themselves. Outsourcing your online dating efforts. Busy professionals who shy away from online services. A consultative approach makes for a more personalized service, with pre-vetted blind dates. Matchmakers take a ladies first approach, resulting in a slow paced, predictable courtship routine built into every date. Minimal control over who you get set up with. As a PDA member, you are the prize. Your dedicated wingwoman provides the most effective consultation service in the industry today, including a personality deep dive, data driven matching, and weekly status call updates. Can’t keep track of Jasmine, Jamie, and Julie? Your personal dating assistant can. It’s her job to keep you informed, and up to date. Disciplined, patient types who enjoy learning and reading. Teaching yourself how to do it yourself. Good tips can shorten your learning curve, or tighten your existing skills. Even if a product transforms you into an online dating wizard, you still have to invest massive time & energy to get consistent results. What works for the author won’t necessarily work for you. Many of these products are hopelessly out of date. We allow you take your foot off the gas, so you can put your online dating life on cruise control. The material our assistants use is the most cutting edge on the planet, refined day in and day out by our experience, and tailor fitted to each of our members own unique profiles. Young men with high energy and stamina. Guys with a passion for fashion accessories. Good for learning basic skills like body language, conversation, and tonality first hand. They cost thousands of dollars. When it’s over, you still have to go out and make approaches regularly to setup dates. We put in the hard work for you. Leaving you more time to actually go on dates, instead of chasing down party girls into all hours of the night, hoping to get lucky. Why wait in line at the clubs, tolerate overpriced drinks, and compete with hundreds of thirsty goons, when you can sit back and let us bring the talent to you? Guys who want to work on their “inner game”, and become more confident. If you lack confidence, a dating coach is helpful to identify and remedy the root causes. Good ones charge upwards of $300 for email coaching, and as much as $3000 for in-person services. They don’t get you dates. We include 1 – 4 hours of phone coaching, along with an entire full spectrum solution attached to it. We are the only company that combines profile makeover, personalized messaging, and a guarantee. In addition to that, no company in the world provides our proprietary inbound lead generation service.